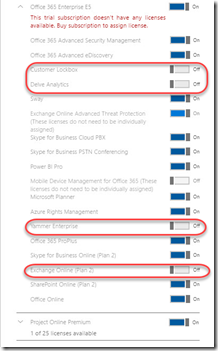 How do i assign Office 365 licenses while disabling sub-license options? 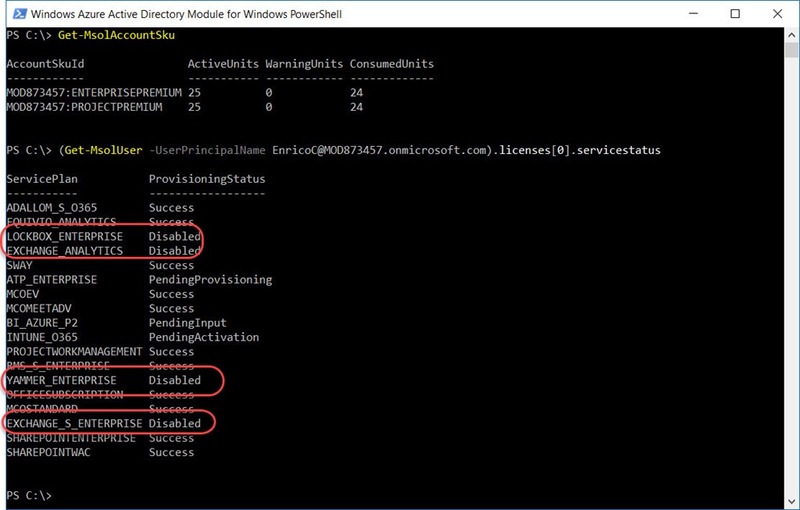 It’s been a while since I’ve gotten a chance to get my hands dirty with some good old PowerShell and last week I got that opportunity. Here is the whole fabulous tale. A customer wanted some helping scripting out their migration to Office 365. They already had directory synchronization set up between their Windows AD and Azure AD. 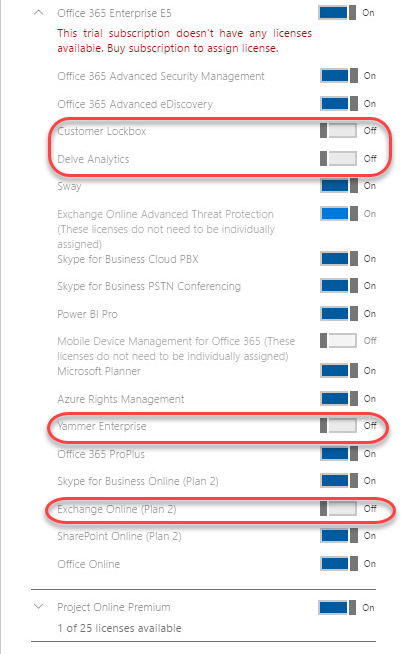 They are slowly rolling out Office 365 to their users, 10 or 20 at a time, and they are rolling out the services gradually. They’re starting with SharePoint Online. They’ll eventually migrate to Exchange Online, and of course they’ll never use Yammer. 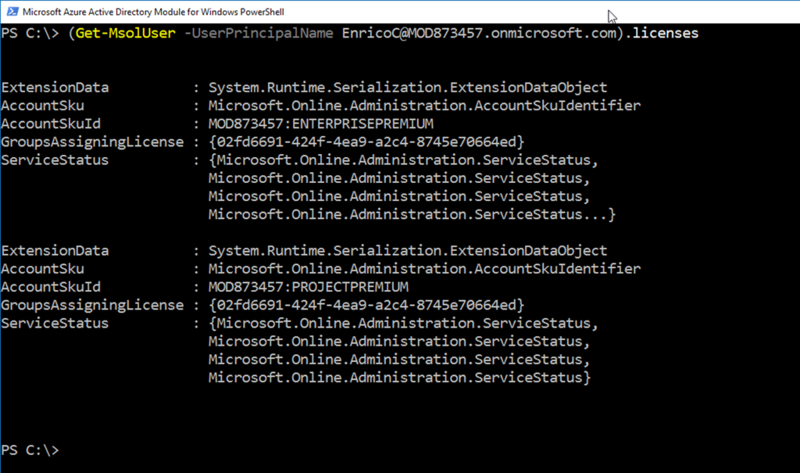 Since they’re doing it in batches, PowerShell is the perfect tool to license up their users, but there was a snag. 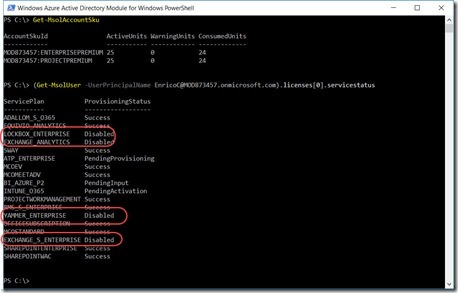 Adding a license to a user in PowerShell is easy, and it’s easy to apply individual license service plans to a user in the UI, but it’s not easy to do service plans in PowerShell, until today. We’re all familiar with using Set-MsolUserLicense to assign licenses to users. The problem is that it assigns all the service plans to the user. In our case we don’t want the user to be licensed for Exchange or Yammer, among other things. Figuring out how to combine the flexibility of the UI, with the the looping and scriptablity of PowerShell is what we’re after. Fortunately, PowerShell had the answer for us. 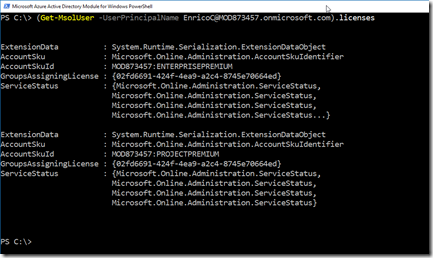 With very little work I discovered the New-MsolLicenseOptions cmdlet. This does exactly what I was looking for. However, using it was a little tricky, so I thought I’d write it up. Now that we have that, we can license our users in the normal way with one additional step to set the options. For completeness, here is the whole process. We have to set the user’s region, then apply the license, then apply the options for that license.